Isabelle Vadeboncoeur is an accomplished musician having completed her diploma in piano (performance) from the Conservatoire de Musique de Montréal. She also received training in African music during her numerous visits to Ghana (dance, song, percussion). 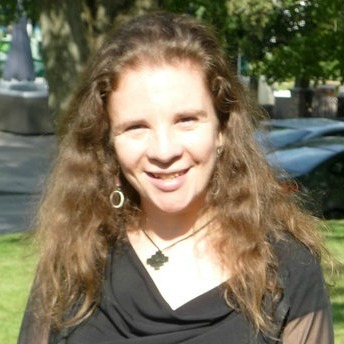 As a member of the faculty of CAMMAC in the Laurentians since 1997 (first as a sports counsellor and then since 2001, as the director of the children and adolescents choirs), Isabelle also teaches African music, piano and for the last several years has been the director of the children and adolescents program. For Isabelle, teaching at CAMMAC every summer is like having a second family: there is no greater pleasure than to be with participants and professors making music in such a magical and inspiring place! Since 2002, Isabelle has been a teacher and pianist with Les Petits Chanteurs de Laval under the artistic direction of Philippe Ostiguy. It is the largest choral organisation in Québec with over 300 singers in three choirs: Les Petits Chanteurs de Laval (PCL – boys choir 8 to 17 years old); Les Voix Boréales (VB – girls choir 9 to 17 years old) as well as Le Choeur des Jeunes de Laval (CJL – 17 to 25 years old having graduated from PCL and VB). Isabelle is the director of the preparatory choir (boys 8 to 10 years old) and the junior choir (girls 10 to 12 years old). In 2014 she joined the faculty of Les Petites Voix du Plateau as the director of the preparatory choir (children in first and second grade in primary school). Isabelle has also taught choral music at The Rudolf Steiner School of Montreal (primary and secondary classes from 2012 to 2015). During this time, she directed two major productions: Oliver Twist and Les Misérables. Among her other musical accomplishments, Isabelle directed on three occasions at Le Centre Bell: Le Choeur des Jeunes de Laval (The Rolling Stones in 2013); Le Choeur de Montreal (Maxime Landry in 2011); as well as the choirs accompanying Claude Dubois at the Gala de L’ADISQ in 2008. In 2015, she again reprised her role as co-director on stage with the CJL and the Rolling Stones at the Plaines d’Abraham in Québec. Isabelle accompanies and codirects several vocal groups in the Montreal area and has so since 2004. A passionate musician able to transmit the love of music to students and singers, she is an excellent pedagogue: creative, responsible and extremely dynamic. She is also the musical director, pianist and clarinettist of Le Cabaret des Inconnus since 2004, performing in Montréal and regions of Québec.